This is a first-rate cooking and fresh eating apple obtained in 1999 from the late Mrs. Clara Daugherty, a very sweet 95 year-old lady who lived here in Ashe Co. She and her late husband once had a large apple orchard in the 1940’s and sold apples throughout North Carolina and Tennessee. The Creek Apple arose as a seedling on the banks of a small creek which runs through her property. Clara contacted us with a request to graft the apple so she could transplant the tree to a more secure location. Too many of the apples would ripen and fall into the creek and be swept downstream. Clara proclaims this to be a much better cooking apple than Wolf River. High praise indeed! 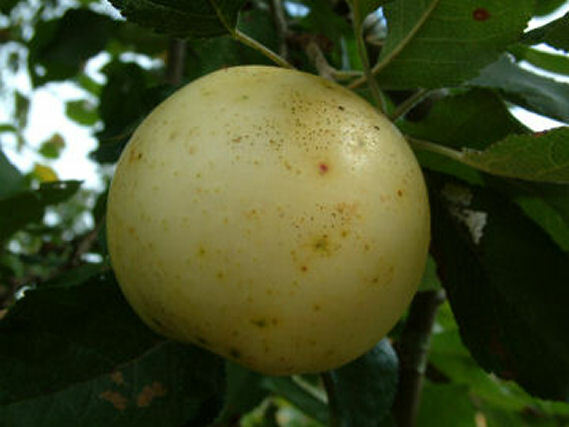 Fruit is medium to above medium in size with pale yellow skin which closely resembles Golden Delicious. Flesh is firm, crisp, very juicy and tart in flavor with warm spicy overtones. It cooks up quickly but does not store well. A dependable bearer ripening in late August to early September.